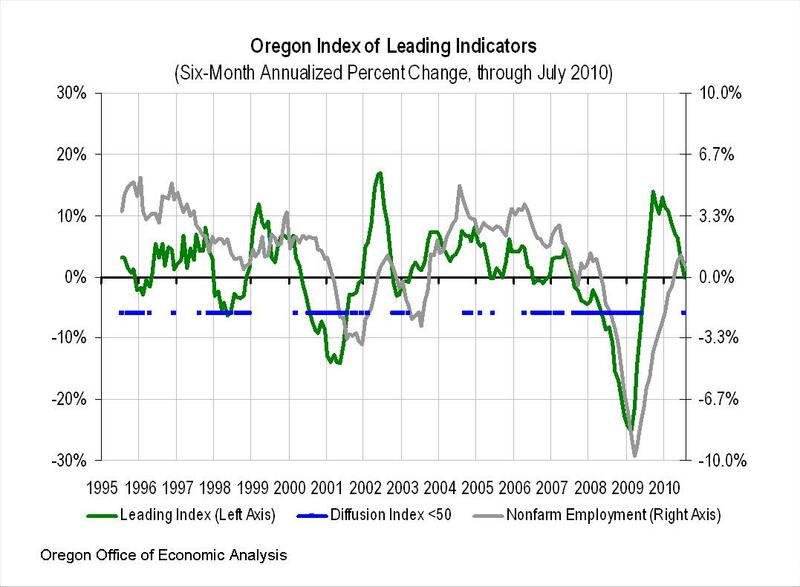 In July 2010, the six month percentage change in the Oregon Index of Leading Indicators was 0.0 percent as the Index was flat relative to January, following a revised 2.7 percent increase the prior month. After increasing for twelve consecutive months, July marks the first non-positive for the Index since June 2009. One a single month basis, the Index has declined for three consecutive months, after peaking in April. Employment, on a six month annualized basis, has returned to the positive for the past four months – that is, employment in each month since April has been higher than the corresponding month from October through January. April 2008 was the last time employment saw positive growth on a six month basis. In July, just three indicators are registering positive values, down from nine the month before and each month this year has had at least eight positive indicators. Industrial Production, Withholding and Air Freight are the three positive indicators, while the Semiconductor Book-to-Bill ratio shows zero change. All other indicators are negative. Consumer Sentiment and Oregon Building Permits are the largest negative contributors. The downward trend in the Index in recent months does not bode especially well for the Oregon economy in the coming months. Similar to the nation, expectations are for a continued economic soft patch through the end of the year. Note: The Leading Index values (green line) are graphed on the left axis with a range of -30% to +30%. Nonfarm Employment values (gray line) are graphed on the right axis with a range of -10% to +10%. Also, the Office of Economic Analysis found an error in the calculation of the Index in the prior blog posting of the February OILI. The error resulted in larger gains than those that actually occurred. OEA regrets the error and has corrected the problem. The full report is available on our website. Our office’s OILI is methodologically consistent with the U.S. leading economic index series produced by The Conference Board and also the University of Oregon Index of Economic Indicators.